It has been known for a long time that clinical evaluation will frequently miss or misdiagnose up to 50% of clinically important cardiac pathology (Canty et al., 2012a; Canty, Williams, et al., 2012; Haji et al., 2013; Heiberg et al., 2016) . Integration of focused cardiac ultrasound with clinical evaluation improves the diagnostic accuracy considerably, such that few important structural or functional abnormalities of the heart would not be detected. 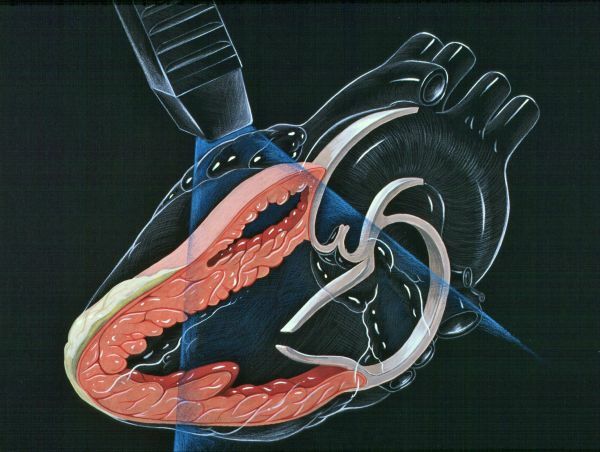 In many other areas of medicine, focused cardiac ultrasound is being incorporated into clinical practice by the treating doctors. This approach reduces the number of missed diagnoses, as well as facilitating earlier treatment changes when pathology is present. What has changed is the introduction of smaller and portable ultrasound machines, which are also cheaper and within the budget of typical general practices. There are now handheld units which provide adequate two‐dimensional and colour flow Doppler imaging to perform focused cardiac ultrasound. These highly portable machines can fit into a briefcase or handbag, or can be shared between multiple rooms with ease. Ultrasound training is also being incorporated into many medical school curricula, and it is highly likely that the next generation of general practitioners will already be trained in multiple uses of basic clinical ultrasound. Prior research related to diagnosis and management of patients after focused cardiac ultrasound have been primarily performed in the anaesthesia and critical care setting, and show diagnostic and management changes of 30 to 50% (Canty et al., 2012a; Canty et al., 2012b; Canty, Williams, et al., 2012; Heiberg et al.,2016) . The basic premise should apply for general practice‐that clinical evaluation alone is not very accurate! A study was performed in a general practice setting in participants over 50 years of age. The focused cardiac ultrasound examinations were performed by a medical student trained in its use, and clinical evaluation by experienced general practitioners. Significant cardiac disease that was missed by clinical examination occurred in 20% of participants, with change in management incurring in 75% of those with new cardiac disease (Yates et al., 2016) . These findings make the use of focused cardiac ultrasound highly relevant to general practice worldwide. General practitioners do not need to be highly trained in echocardiography, as their use will be focused or goal‐directed to complement clinical examination. Basic education, including knowledge and hands‐on learning, is required for adoption of this technology. The Ultrasound Education Group at the University of Melbourne focuses on the development of learning in Clinical Ultrasound by utilising Online Courses as well as Hands-on Workshops and Simulator Training Programs. You can visit their website to view a wide-ranging study option or enquire for more information by clicking the button below. Canty, D.J., Royse, C.F., Kilpatrick, D., Bowman, L. & Royse, A.G (2012a). The impact of focused transthoracic echocardiography in the pre‐operative clinic. Anaesthesia, 67(6), 618‐25. Canty, D.J., Royse, C.F., Kilpatrick, D., Bowyer, A. & Royse, A.G (2012b). The impact on cardiac diagnosis and mortality of focused transthoracic echocardiography in hip fracture surgery patients with increased risk of cardiac disease: a retrospective cohort study. Anaesthesia, 67(11), 1202‐9. Canty, D.J., Royse, C.F., Kilpatrick, D., Williams, D.L., Royse, A.G. (2012). The impact of preoperative focused transthoracic echocardiography in emergency non‐cardiac surgery patients with known or risk of cardiac disease. Anaesthesia, 67(7), 714‐20. Coller, J., Campbell, D., Krum, H. & Prior, D. (2012). Transthoracic echocardiography findings. Implications for clinical management. Australian Family Physician, 41(12), 954‐958. Haji, D.L., Royse, A., Royse, C.F. (2013). Review article: Clinical impact of non‐cardiologistperformed transthoracic echocardiography in emergency medicine, intensive care medicine and anaesthesia. Emerg Med Australas, 25(1), 4 12. Heiberg, J., El‐Ansary, D., Canty, D.J., Royse, A.G. & Royse, C.F. (2016). Focused echocardiography: a systematic review of diagnostic and clinical decision‐making in anaesthesia and critical care. Anaesthesia, 71(9), 1091‐100. physician‐performed ultrasound: the time has come for routine use in acute care medicine. Anesth Analg., 115(5), 1007‐28. Yates, J., Royse, C.F., Royse, C., Royse, A.G. & Canty, D.J. (2016). Focused cardiac ultrasound is feasible in the general practice setting and alters diagnosis and management of cardiac disease. Echo Res Pract, 3(3), 63‐9.